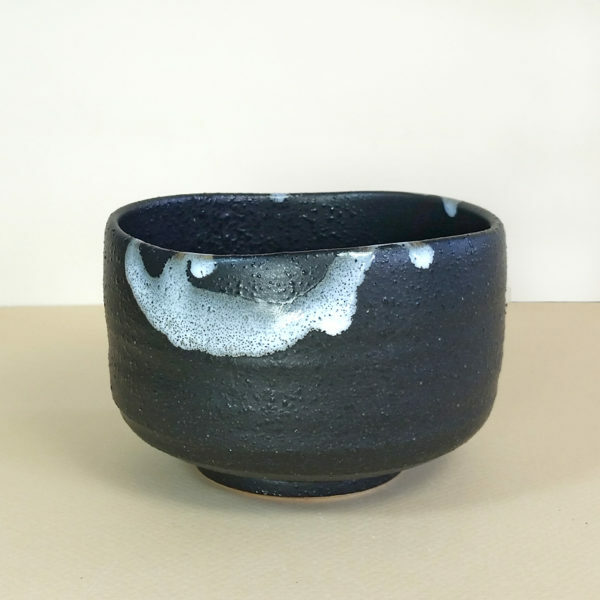 This distinctive black semi-gloss glazed matcha bowl is an artistic representation of an interesting geological phenomenon known as a moraine. As glaciers move across a landscape, they can pick up, move and redeposit large amounts of rock and soil. This redeposited material is called a moraine. The wonderfully textured surface of this tea bowl represents the moraine while the whisps of white glaze depict the receding glaciers. For the utility of this chawan, the moraine serves as the ‘face’ of the bowl. So depending on whether one is drinking alone or with friends, the ‘moraine’ may face towards or away from the tea drinker. Either way, this is a dramatic coloration for a chawan and the foamy green of the whisked matcha tea is exquisite against this dark background color.